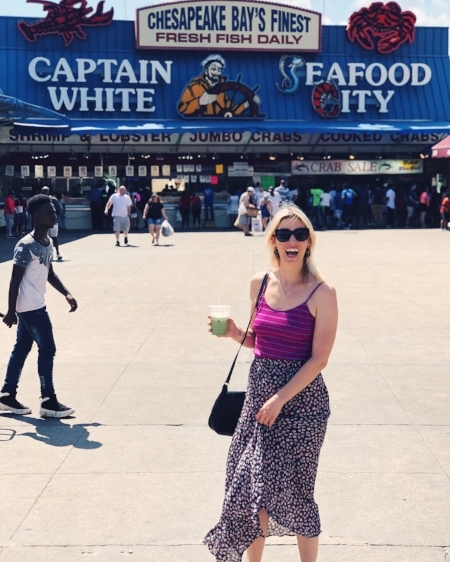 I have never been more excited to write a weekend guide for a city. I am absolutely over the moon about Washington D.C. after returning from a weekend trip with friends. It is such an amazing city, with picturesque views everywhere you turn (and I am not talking national monuments), cool neighborhoods that each have their own charm, an eclectic mix of eateries to suit every craving, friendly locals, and a big score for walkability and getting around on a bike. So let's dive in! If you are heading to D.C. for the weekend, here are my recommendations for how to spend it. After our bike ride to Georgetown in the crazy heat + humidity, sweaty and happy! Explore the neighborhood you are staying in by going for a walk and picking a restaurant close by. I arrived at 7pm, dropped off my bags in Adams Morgan and heading to Tail Up Goat. Highly recommend if you can get a reservation or don't mind waiting an hour or so. Plenty of other places to explore nearby while you wait. Wake up, grab a green juice nearby at JRINK then find the nearest Capital Bikeshare and grab a bike! We biked from Adams Morgan to Georgetown using the Rockway Creek Parkway. Most of the route was downhill and absolutely a beautiful ride with lots to see along the way. You can head directly to the Georgetown Waterfront Park to walk around and enjoy the sites, or if you didn't grab a green juice beforehand you can grab a massive smoothie bowl at South Block in Georgetown. If you are hungry for more, head to Shouk for lunch. After dropping your bikes off and eating to your hearts delight, take the time to wander around Georgetown, hike up the stone steps that were used in the filming of the exorcist to satisfy your inner 80s child (and also to work those buns, hun). Explore the campus, or if shopping is your thing, head over to M Street to get your fix. After taking a much needed rest after all that biking, eating and walking it's time for dinner and more exploring. Head to Blagden Alley and put your name in as early as you can at The Dabney. This place was the best meal I had while in town. If there is a long wait, head to Calico Cat to enjoy their amazing outdoor patio in the meantime. If you are looking for a place to go post dinner, grab an amazing craft cocktail at The Columbia Room or a tiki drink at Lost and Found. Sleep in and head to DC Harvest or Sally's Middle Name for brunch along the H Street Corridor. Afterwards walk up to the Union Market to walk around, explore and ooh and ahhh at all the goodies. After making your morning all about food, head over to the National Museum of African American History and make your afternoon all about culture. If the weather is not crazy hot, join the tourists and walk along the National Mall past the Washington Monument and to the Lincoln Memorial. In the evening head to Dupont Circle. Plenty of things happening here and a good time to rest your wallets and explore some of the amazing and healthy fast casual restaurants. Pick between CAVA and The Little Beet for a dose of nourishing ingredients without breaking the bank. You could even take to go if you need to head to the airport. I was lucky to visit D.C. for the Labor Day Holiday weekend, so we had an extra day to explore. Head to Fruitive for smoothies and the most amazing GF and Vegan waffle you will ever have. Then head over to the Wharf and Navy Yard to walk around and check out the sites. Need a smoothie or matcha latte? Head to Toastique for some healthy goodness. If you have extra time (or if you flew in via BWI airport) head up to Annapolis, Maryland. This historic town has so much freaking charm! Walk around, explore the sites and check out Fox Books to hang on their patio. 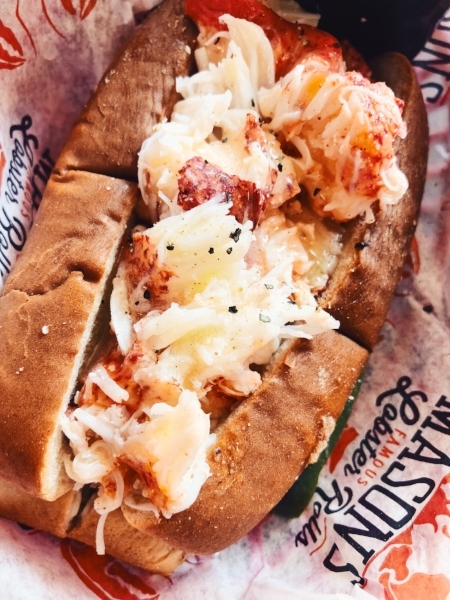 Do yourself a favor while you are there and grab a lobster roll at Masons Famous Lobster Rolls. They also offer a massive lobster salad.